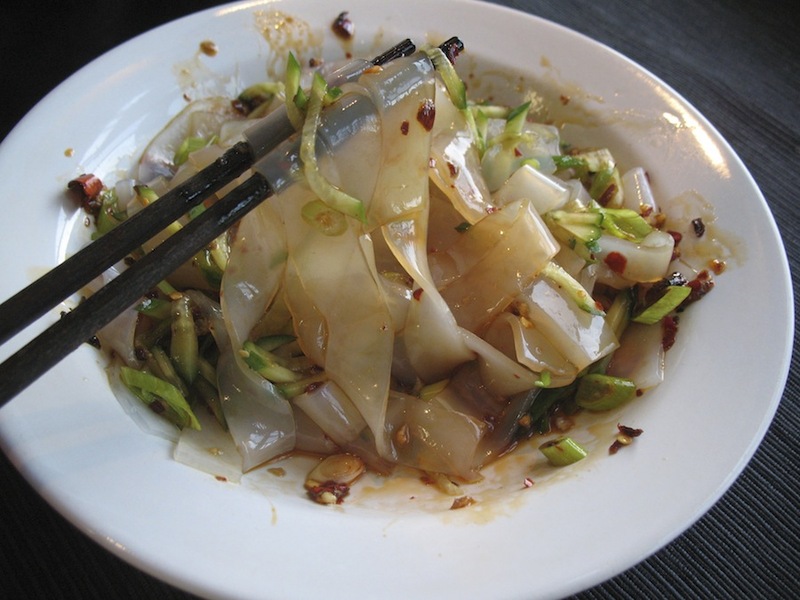 The way I first experienced this unusual dish, was as a flat, rubbery kind of chili oil-laced treat. That was via a Guangzhou hole-in-the-wall restaurant near my school (as I first experienced Guilin mifen). Back in the ’90s, Guangzhou was a sprawling metropolis that contained one-story shop neighborhoods of recent-arrived migrants. People from all over China flocked to Guangzhou to take advantage of the booming economy of the coastline (Deng Xiaoping’s reforms provided for easy overland and overseas investment opportunities, and restauranteurs supported the workers of those establishments). A lot of people were in the small restaurant business. I and my classmates thoroughly enjoyed the variety of skilled cooks in the neighborhoods near our school. These days, those interesting small shops and restaurants have been pushed even further to the outskirts of Guangzhou as the city has been reborn and rebuilt. For me, a student with no income, cheap regional cuisine restaurants were the best place to be. Each tiny shop had its own delicious specialty, and they did mostly (if not only), that. For a consumer, that kind of restaurant setup is so much easier to navigate. Do I feel like Lanzhou style beef noodles, Guilin style rice noodles, Sichuan style cuisine, clay pot-rice, dim sum, jiaozi, or something else? If you choose, you don’t have to “settle”. You know it’s going to be good. And, back then, it was dirt cheap. I miss that so much. Now, in the US, we are faced with so many restaurants that strive to be the end all restaurant for all consumer desires. What that amounts to is amazing mediocrity. Some actually do very well with some dishes, but that is not maintained and not promoted as a unique specialty. Too bad. Back to the cold jelly noodles. Let me show you how I make those refreshing, surprisingly well flavored noodles. 1. Find (or make) mung bean starch. The kind I use I find at Southeast Asian markets. This starch is meant to be used for Thai specialty deserts. 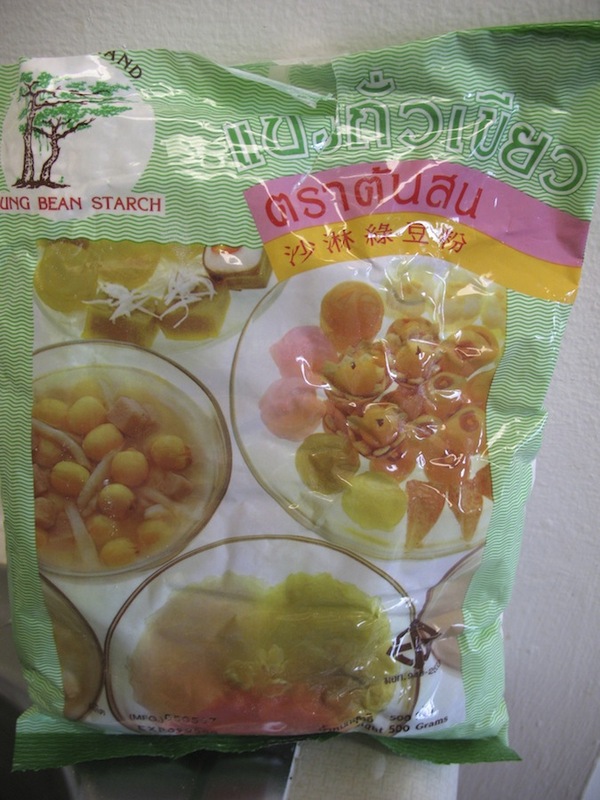 It is “Thai brand mung bean starch” or แป้งถั่วเขียว. Measure out 1/4 cup of this starch and add it to 1/4 cup of water. 2. In a separate small pot, bring 1.5 cups of water to boil. Whisk the starch and water mixture until incorporated, and slowly pour this into the pot of boiling water, whisking all the time. 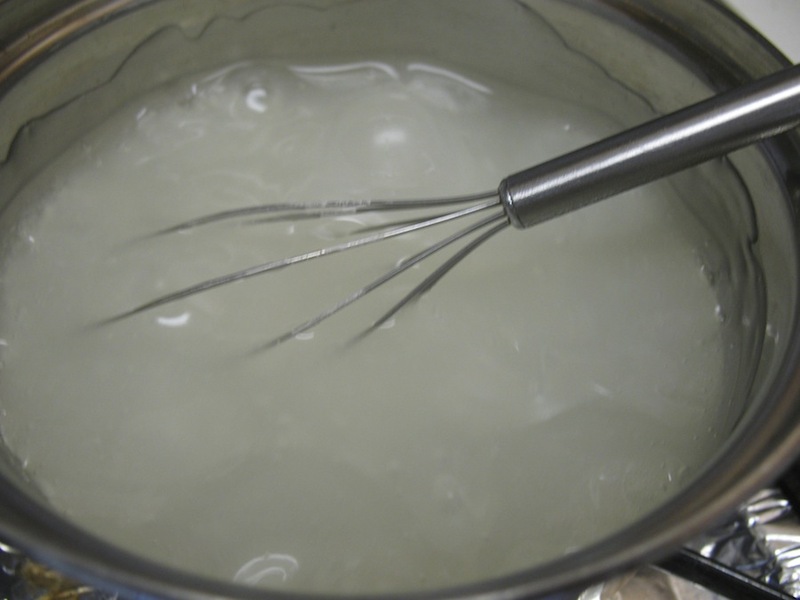 Whisk for about 5 minutes, while it bubbles away. 3. 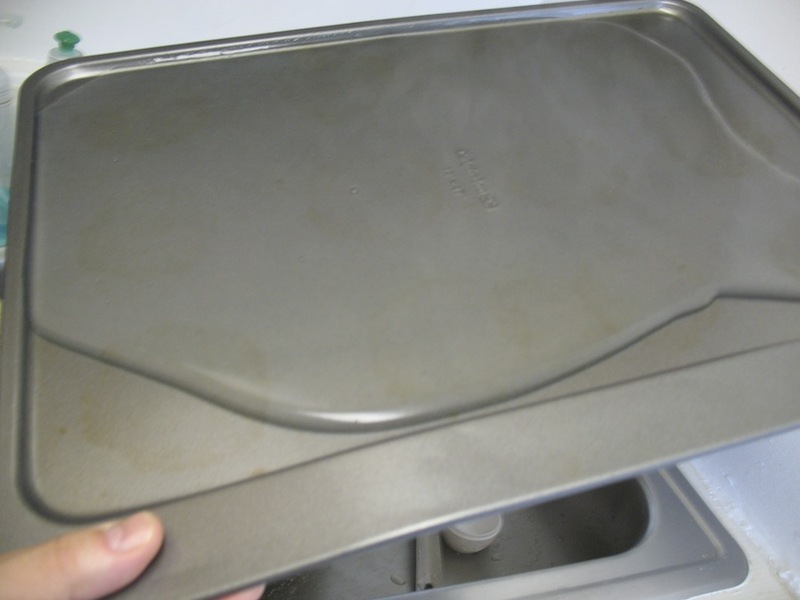 Take the mixture off heat, and pour it onto the largest cookie sheet that you have that will fit into your refrigerator (prepare ahead of time to make sure of that fit). 4. 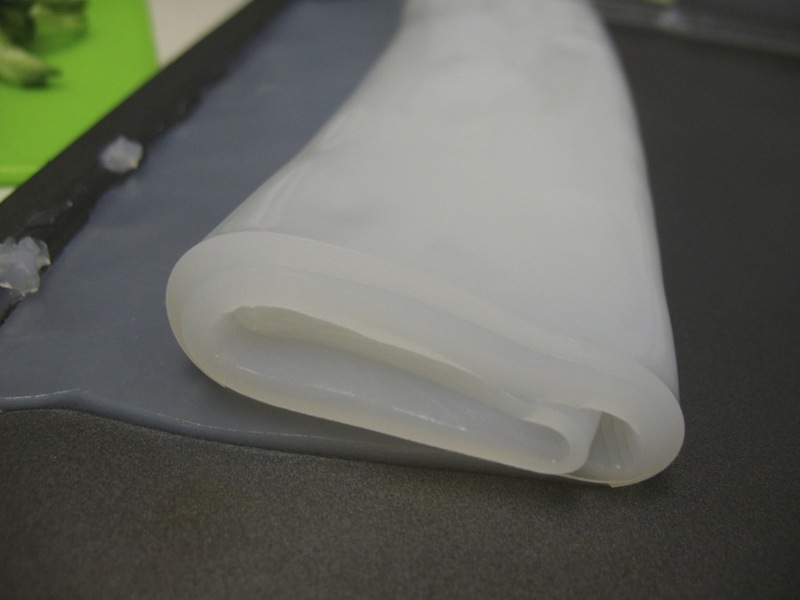 Quickly, tilt the cookie sheet continuously, so that the jelly coats the whole surface. Let this rest on the counter until it is cool enough to put in the refrigerator. 5. Make the sauce. In a small bowl, combine huajiao oil (1 tbsp), along with chili oil sediment (1 tbsp), soy sauce (1 tsp), a little salt (1/2 tsp), some garlic that has been pressed (3 cloves), some sugar (1/2 tsp). Mix well. Finely chop some small cucumber (optional) and some green onion and cilantro (optional). 6. 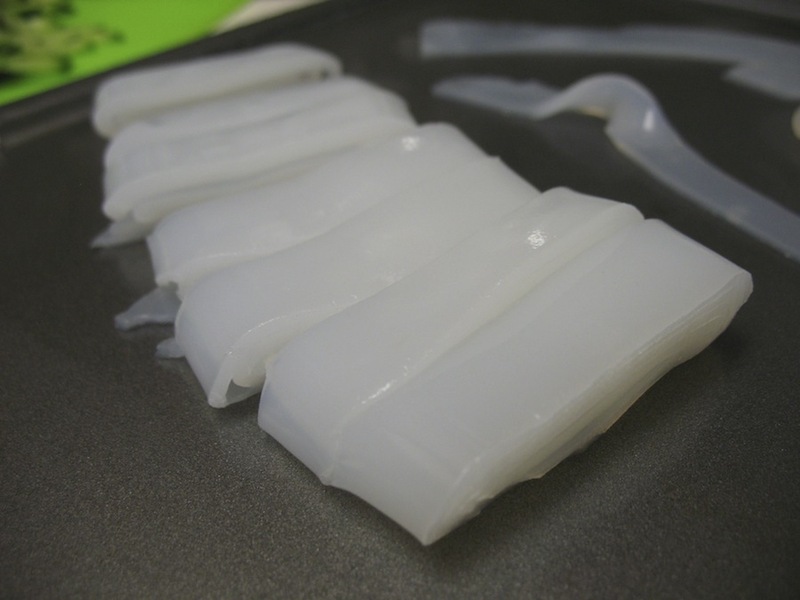 Remove from refrigerator after cooled, as soon as 10-15 minutes, and roll the jelly up. 7. Use a spatula or something plastic to cut the roll into slices. You can then unroll each noodle to the serving dish. 8. Lay noodles in the serving dish, add cucumber (if using), and green onions and cilantro. Then spoon the sauce over the top. You don’t have to use it all, adjust to taste. 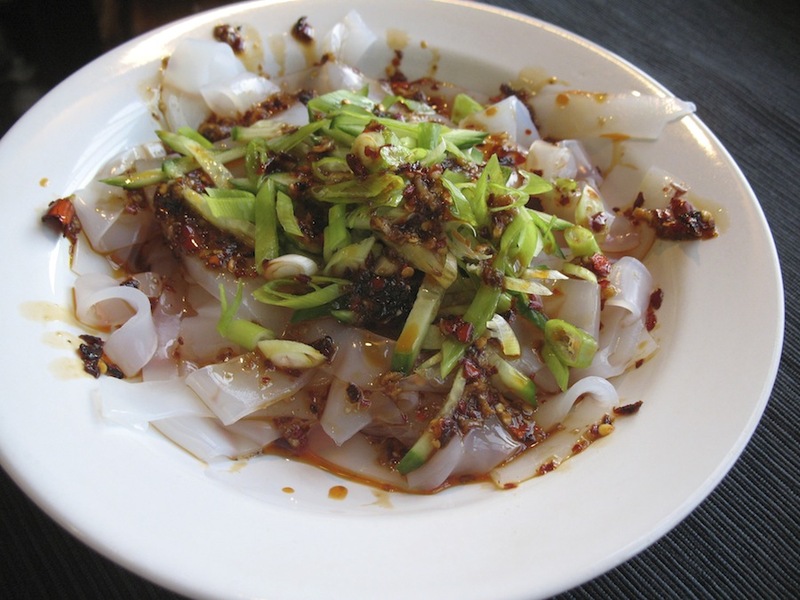 This entry was posted in - Featured Food Discoveries, - Recipes, Central Asia/Uyghur food, Chinese food and tagged ซื่อชวน, cold dish, 粉皮, fenpi, liangfen, Sichuan, لەمپۇڭ, 凉粉, 四川. Bookmark the permalink.